Rock Creek park has many acres of semi-natural communities , which are plant communities growing in areas where the soil and/or vegetation was substantially disturbed in the past by a severe natural disturbance , or human activities such as plowing, logging, or quarrying. Because semi-natural communities are an integral component of the Rock Creek Park landscape, they are included in the Rock Creek Park Map, and are briefly described here. The vegetation in these areas is relatively young and is giving way (or succeeding) to other, more natural communities. Ecobit: Forest Succession—Clues to the Past As vegetation in a successional community changes over time, there is a turnover in the wildlife that use the area. For instance, grassland birds in an abandoned field eventually give way to woodland birds as the field succeeds to forest. The first three semi-natural communities on the list below have official names and codes because they are familiar patterns across the Mid-Atlantic and are part of an official classification called the USNVC. The last four help describe what is found at Rock Creek Park, but are not regionally recognized semi-natural communities. Map tip: Search for these semi-natural communities by name (or part of the name) on the interactive map of Rock Creek Park. Photographer: Sam ShelineAlthough it may look like an intact natural community with its magnificently towering, straight tuliptrees, the Successional Tuliptree Forest (Rich Type) is a semi-natural community because it likely grew up in response to a human-induced disturbance . How do we know that? Tuliptree (also called tulip poplar or yellow poplar) doesn’t produce many seedlings in an established forest. Instead, this species germinates and grows best where disturbance has exposed the mineral soil and produced a large sunlit opening in the forest canopy. After a forest has been cleared, if tuliptree seeds are present in the seed bank or are blown in by the wind from nearby trees, they are quick to germinate. Tuliptree is often among the first trees to come back on moist soil, often shading out slower-germinating competitors for sunlight. An even-aged stand of pure tuliptree, therefore, is evidence of forest regrowth from some past major disturbance. At Rock Creek Park, the Successional Tuliptree Forest (Rich Type) grows in areas that may have been cleared and farmed long ago. Upwards of a century has passed since the soil disturbance that created most examples of this semi-natural forest and the regrown forest appears quite majestic in some areas today. This tuliptree-dominated community can be found occasionally throughout the park on somewhat moist, well-developed soils . The understory is often lush, containing northern spicebush and various herbaceous plants . In some sites, groundwater may supply extra base minerals. These forests tend to be heavily invaded by non-native plant species. Chestnut oak saplings (Quercus prinus) bide their time in the understory until a tree in the canopy falls, admitting more sunshine so they can mature. Triple-trunked tuliptree ( Liriodendron tulipifera) — likely regrown from a stump. Photographer: Erin Lunsford Jones, courtesy of NatureServeAt Rock Creek Park, this community is characterized by the dominance of tuliptree with some similarly-aged oak including white oak and northern red oak in the canopy. Non-native invasive species are often dominant in the shrub layer and field layer . This forest commonly has a weedy appearance because it consists of relatively small trees growing close together, and contains an abundance of non-native species in the understory. 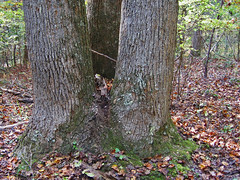 The Successional Tuliptree – Oak Forest occurs in small patches throughout the park on land where the vegetation was heavily disturbed—perhaps logged—but the soil was not plowed. This community is distinguished from the Successional Tuliptree (Rich Type) by the presence of oak in the canopy, and by a low diversity of native shrubs and herbaceous plants. Northern spicebush is not common here. As this successional forest ages, its distinctiveness from the Mesic Mixed Hardwood Forest or other natural communities gradually disappears, except perhaps for its greater abundance of invasive species in the understory. Virginia pine, like tuliptree, is an early successional tree, but exposed mineral soil is essential for its seedlings to get established, and it can tolerate drier conditions than tuliptree. Through the 1970s, pine trees were frequent components of upland forest communities in Rock Creek Park2, where they may have become established in areas cleared for agriculture or Civil War forts and sight-lines. Many have since died, but some can still be seen near the Rock Creek Golf Course and Horse Center. As the park’s forests age and mature, the Successional Virginia Pine Forest is fast disappearing. 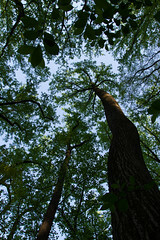 When a pine tree dies in the interior of a forest, oak or American beech usually replaces it in the forest canopy. Currently, Virginia pine trees are more often encountered as part of the Coastal Plain Oak Forest in the Fort Circle Parks, or as individual remnants within other natural communities such as the Mixed Oak / Heath Forest between Bingham Drive and Wise Road in the northern portion of the park core. Successional Mixed Deciduous Forests in Rock Creek Park are of variable composition and age. Most of these stands are a mix of native and non-native sun-loving, fast-growing “weedy” tree species that colonize disturbed ground. Typical native species include black locust trees, tuliptree, elms, box-elder, and poison ivy, and native cherry species. Non-native species include Norway maple, honeysuckle shrubs, multiflora rose shrubs, English ivy, and non-native cherry species. 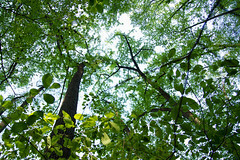 Planted Evergreen Forests are areas at Rock Creek Park where evergreen trees appear to have been planted in the past. Evidence of planting may be more or less obscured in today’s landscape depending on the length of time since planting occurred, and how long ago the stand was last thinned of other kinds of trees and shrubs. The so-called Historic Quarry semi-natural community at Rock Creek Park is dominated by hardy and fast-growing non-native invasive trees, vines, shrubs, and small plants. Not too many native plants can be found growing in these areas that were formerly disturbed by quarrying. 1. Fleming GP. 2007. Personal Communication re: vegetation communities at Rock Creek Park. Vegetation Ecologist.